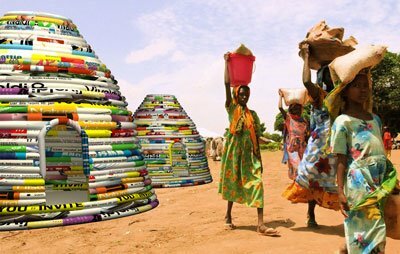 Each year the Society for Environmental Graphic Design sponsors a contest to recognize the best in environmental graphic design. This year’s Juror’s Award went to Norman Lee and Charles Houser for their Billboard Earthbag Project. According to the jurors, they "were intrigued by this project as an example of ‘cradle-to-cradle’ design pertinent to the signage industry. 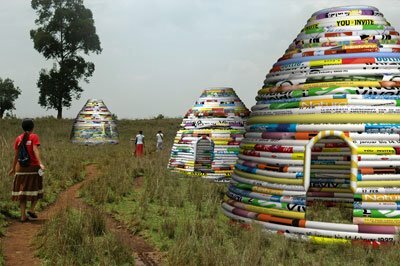 Utilizing intrinsic qualities of billboard PVC—UV resistant and near indestructible—this concept proposes the creation of dwellings from recycled material and imagery. 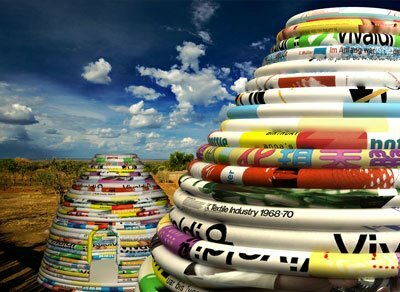 The idea takes the recycling of billboards, street banners, and print graphics—already employed by art museums in the creation of second-use products—to another level. Truly inventive!" This all sounds pretty good, and might well work if the billboard material were cut and sewn into bags. One obvious disadvantage of the idea is that since PVC is toxic when burned, this would present a potential hazard to the occupants, but of course this is true of many modern building materials. PVC poses a great risk in building fires, as it releases deadly gases long before it ignites, such as hydrogen chloride which turns to hydrochloric acid when inhaled. As it burns it releases yet more toxic dioxins. Additionally, vinyl does outgas highly toxic VOCs over time. Fortunately most of this danger would have passed with the use of recycled signs, but this could also be an issue. Wow, these are amazing pictures! I enjoyed your post. Yes is very good post. It`s very intresting information. This is such an exciting idea - wonder how it would really look like. Living in South Africa I can really imagine htat this would be a great way to provide affordable housing for so many. Exporting toxic waste once again, America? ..And EU has for years been looking into outlawing PVC, but seems as if the lobby is to strong. Thank you heaps for your site and all you do Kelly, but this one here is almost as bad as building houses out of tires (when rammed earth houses has stood for 1000+ years without tires)..or heaven forbid; the concept of 'firing' an earthen home (Kalele style), making it much less breathable, coated with sod and wasting precious fire wood. Auch!